Most visitors to London use the famous underground trains (the “tube”) or a double-decker bus to see the city (one can also use rivers and canals). So I thought, during the tourism month of August, I would show you an alternative overground circumnavigation of the city using the metaphor of benzene. Benzene you see is a ring, comprising three “HCCH” segments. The so-called Kekule vibration in benzene (the b2u mode for anyone interested) induces three pairs of carbon atoms to repeatedly travel towards each other and then reverse and travel away from each other. One can also travel in this manner using the London Overground train system. The three segments connect Clapham Junction (yes, more or less the same Clapham of Kekule’s omnibus) to Willesden Junction. A second segment goes from there to Highbury and Islington, and a third from there on to Clapham again to complete the cycle in the clockwise direction. Since trains travel in both directions on each of the three segments, one can (like a carbon atom) oscillate to and fro in any segment, or (like an electron) circulate all the way round (no doubt either diatropic or paratropically with respect to the earth’s magnetic field). Yes, the metaphors are rather contrived; sorry but it is August after all. Here are some photos. 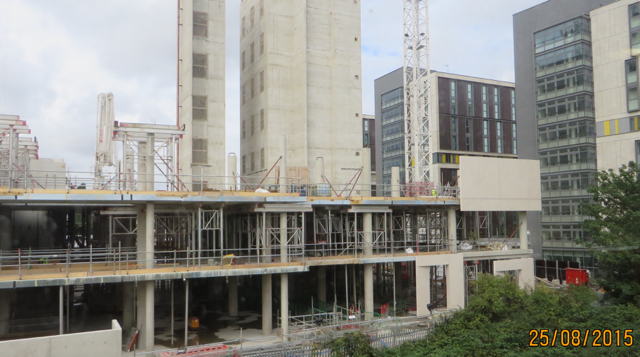 The first is along the Clapham/Willesden Junctions section, showing the new chemistry building at Imperial College in the early stages of construction. This will be part of the new White City campus about 5km west of the original South Kensington one. The completed buildings on the right are residences, and the whole site used to be where BBC Enterprises first marketed its productions worldwide and not far from where the BBC television studios broadcast from until recently. This is at Clapham junction itself, platform 1 of 18. 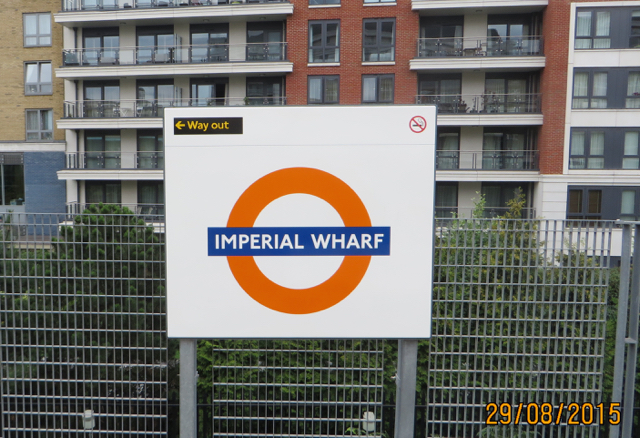 This is also along this segment (Imperial’s very own station :-). Way out indeed! And the Thames finally, looking east. On the left is the very exclusive Chelsea harbour apartment complex, some of the most expensive in London. Residents commute by boat rather than train. In the distance somewhere are London and Tower bridges. This entry was posted on Saturday, August 29th, 2015 at 4:54 pm and is filed under General. You can follow any responses to this entry through the RSS 2.0 feed. You can leave a response, or trackback from your own site.